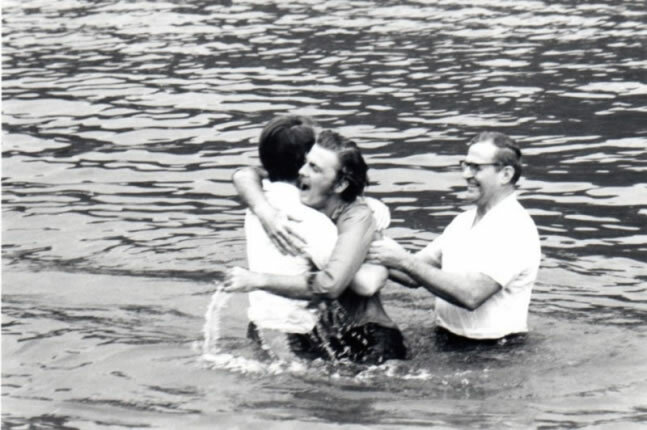 07 - A large group from the prayer meetings held in the Williams' home gathered at a nearby river to be baptized by Williams and a Spirit-filled Baptist pastor. When Williams accepted a call 1959 from Austin Presbyterian Seminary to become their professor of Systematic Theology, it was with both sadness to leave the church and joy to be able to do what he had longed to do—teach Systematic Theology at a Presbyterian Seminary. After five years as a professor at Austin Seminary, he was granted an early sabbatical (1964-65) that he might represent the Southern Presbyterian Church at several theological and ecumenical conferences in Europe and be an official Protestant Observer at the Second Vatican Council, have time to do some writing, and to accept a request to teach at the Presbyterian Seminary in Taiwan for the spring term. If you read the Preface of his book A Theological Pilgrimage, you will find how that sabbatical prepared him to latter seek and receive the baptism of the Holy Spirit. Back in Texas, after both he and his wife and daughter Cindy were filled with the Spirit (it took longer for the two sons), prayer meetings were held in their home every Sunday evening for six years—often with over a hundred people or more pouring in, many of them students from the University of Texas and the seminary.